Comcast VoIP is a software product line of reliable, scalable, and cost-effective VoIP (Voice over IP) solutions that empower businesses of all sizes to manage their communications on the go, set up a PBX phone system in the cloud, and take advantage of the capabilities offered by the Comcast Network, the largest VoIP network in the United States. Built by a prominent VoIP service provider, Comcast VoIP aims to help companies and businesses speed up communications, improve profitability, and drive business growth. Furthermore, Comcast VoIP delivers an application that is built with voice mobility features. This advanced phone solution allows users to make outbound calls and answer inbound calls directly within the app. It also permits them to upload and organize contacts in a systematic manner as well as easily track calls. The suite of VoIP solutions includes a cloud-based PBX system which is flexible and easy to learn. The PBX system comes with a web portal which can be used for managing and configuring phones and performing system administration. Last but not least, Comcast VoIP offers a PRI or Primary Rate Interface trunking solution which enables users to leverage their existing PBX system, connect with the Comcast VoIP Network, and access features built for managing calls during emergency situations such as when there is a power outage or natural disaster. Comcast VoIP has a business phone solution which makes it possible to handle communications from mobile devices. Named as Business Voice, this solution utilizes a mobile application which permits users to make and take calls wherever they are. The app also supports voice messaging wherein they will be able to listen to voicemails as well as distribute them across their organization. When they receive a voice call or voicemail message, the application automatically sends a notification. As users receive incoming calls, Business Voice enables them to route the calls between different phones and individuals. Thus, an employee, staff, or team member can take calls on his or her own mobile device from any location. In order for them to dial numbers quickly, the solution lets them put their contacts in an area that they can easily access and upload new contacts into. Comcast VoIP is equipped with a cloud-based PBX or Private Branch Exchange phone system that organizations and businesses can easily set up without the need for purchasing any major equipment. A PBX phone system is a private telephone network and system used for handling communications within the organization and outside it. Such phone system can be run either in the cloud as a hosted or virtual solution, or on-premises as an in-house system. The PBX phone system is a modern communication system which eliminates the need for using multiple phone lines. Comcast VoIP’s cloud-hosted PBX phone system delivers features and capabilities that assist users in revolutionizing their phone service. One of them is the ability to ensure that the quality of calls is superior. The system helps users assess first the performance of their network before they make calls. They will also be able to track call quality continuously in real time. Phone line monitoring is another feature offered by the PBX phone system. Here, users will be able to verify who’s taking a call or if someone is available to receive a call. They can also confirm the appropriate time when they need to transfer calls or receive messages. Interestingly, the PBX phone system even allows them to receive calls that are routed to their coworker’s phone. In addition, the PBX phone system has an automated virtual attendant or receptionist feature wherein incomings calls are automatically routed to the right department or extension. The virtual attendant can be customized in a way that users can define how calls being made during after hours or holidays are routed. Comcast VoIP comes with PRI trunking capabilities which are available in its VoIP solution called Business Trunks – PRI. PRI trunks are used to connect an existing PBX phone system to a phone service provider. Once the PBX system is linked with the phone service provider, the public switched telephone network or PSTN can now be accessed. With Business Trunks – PRI, users will be able to connect to the largest VoIP network in the United States which is the Comcast Network. This doesn’t only allow them to leverage their existing PBX phone system and protect their communication technology investment but also lets them ensure that they are able to minimize disruptions in their operations. Business Trunks – PRI enables users to automatically reroute calls to other sets of trunks in the event of a power outage, natural calamity, or other emergency situations. This is actually one of the disaster recovery features included in Business Trunks – PRI. When there are technical issues on the network, Business Trunks – PRI has the capability to immediately route calls to alternate networks. This ensures that business voice calls are always flowing smoothly and continuously. Business Trunks – PRI also delivers a security feature through which all network equipment can be accessed using a two-way authentication method. 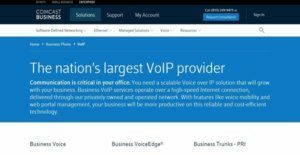 If you are considering Comcast VoIP it may also be sensible to analyze other subcategories of Best Business Phone Systems gathered in our base of SaaS software reviews. There are well-liked and widely used systems in each software category. But are they automatically the best fit for your company’s unique wants? A popular software product may have thousands of subscribers, but does it offer what you need? For this reason, do not blindly spend on popular systems. Read at least a few Comcast VoIP reviews and mull over the aspects that you desire in the software such as the price, main features, available integrations etc. Then, select a few systems that fit your needs. Try out the free trials of these platforms, read online opinions, get explanations from the seller, and do your research thoroughly. This profound homework is sure to help you choose the finest software platform for your company’s special wants. How Much Does Comcast VoIP Cost? We realize that when you make a decision to buy Business Phone Systems it’s important not only to see how experts evaluate it in their reviews, but also to find out if the real people and companies that buy it are actually satisfied with the product. That’s why we’ve created our behavior-based Customer Satisfaction Algorithm™ that gathers customer reviews, comments and Comcast VoIP reviews across a wide range of social media sites. The data is then presented in an easy to digest form showing how many people had positive and negative experience with Comcast VoIP. With that information at hand you should be equipped to make an informed buying decision that you won’t regret. What are Comcast VoIP pricing details? What integrations are available for Comcast VoIP? If you need more information about Comcast VoIP or you simply have a question let us know what you need and we’ll forward your request directly to the vendor.